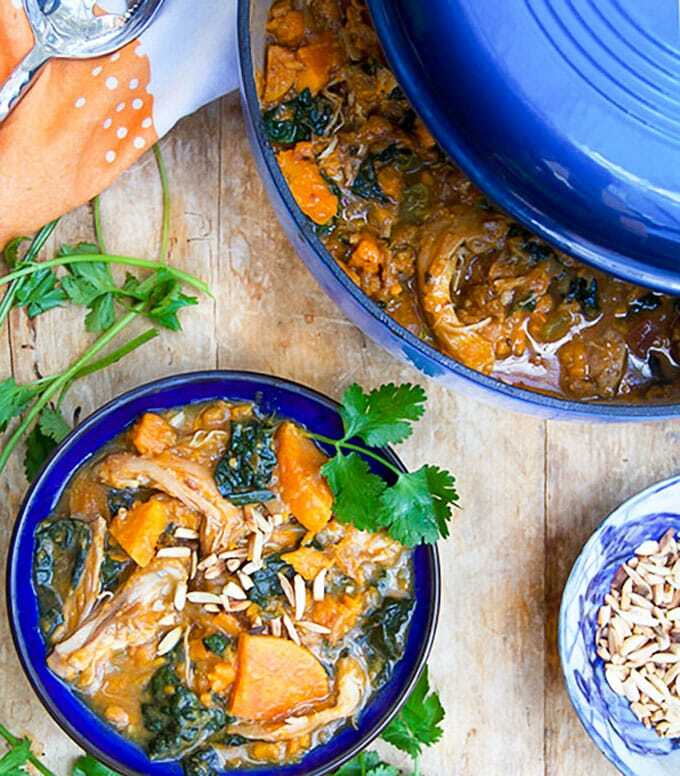 This Moroccan Chicken Stew is one of my favorite one-pot dinners. It’s easy to prep and delicious enough for a special occasion. A gentle oven braise yields fall-apart tender chicken thighs and vegetables, infused with wonderful aromatic spices. It’s gluten-free, dairy-free and Paleo. 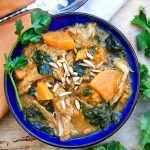 I shared this recipe for Moroccan chicken stew with sweet potatoes long before I had a food blog, before we all used the internet and before email was a common means of communication. It’s one of my longtime favorite recipes. The chicken is super tender and it soaks up all the delicious flavors of cinnamon, cumin, garlic and ginger. The sweet potatoes and kale are healthy and delicious. The apricots melt into the sauce with their tangy sweetness. It’s a perfect hearty, healthy one pot meal. The whole recipe happens in one pot, which always makes me happy. While the oven is pre-heating brown the chicken in the your heavy pot or Dutch oven. Set them aside and sauté your aromatic vegetables: onions, garlic and ginger. Then toast the spices for 30 second: cinnamon, cumin, coriander, paprika, red pepper, and salt. Return the chicken to the pot and add sliced sweet potatoes, dried apricots, chicken broth and lemon juice. Cover the pot and set it in the oven for a 45 minute braise. Remove the pot from the oven and immediately add the slivered kale, which will wilt from the heat of the stew. This recipe comes from my mother-in-law Barbara, who first cooked it for the family more than 20 years ago. She had a little faded newspaper clipping of the recipe with her own scribbled notes on it. Her friend Joanie had given it to her many years before. I copied it by hand onto a piece of lined paper, took it home, and typed it out on my computer, onto my “favorite recipes” file. I shared it over the phone or by handing out xeroxed copies to friends and neighbors. Sharing and liking was different back then, before Facebook and links and blogs and Epicurious, but recipes still managed to get around. Some even went viral. I’m pretty sure this one did. I don’t have any official counts, but I hear from friends and relatives, from time to time, that they are still cooking it and sharing it and enjoying it. 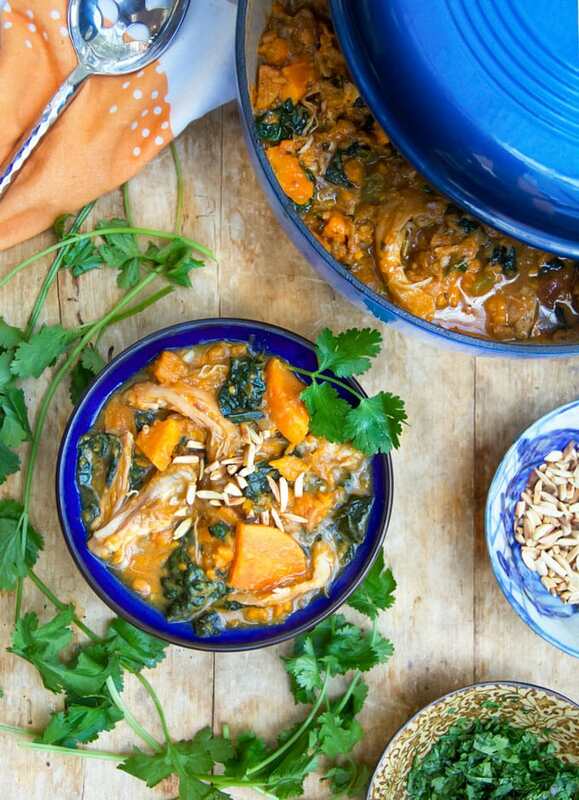 Gazing into this bowl of Moroccan chicken stew brings me back in time. I remember standing on Barbara’s front porch with my husband Eddie and the kids, waiting for her to come to the door, her delight in seeing us and the kids, the warmth of her house, and the wonderful aromas emanating from her kitchen. She was an amazing cook. Lots of my favorite recipes and inspiration came from Barbara. 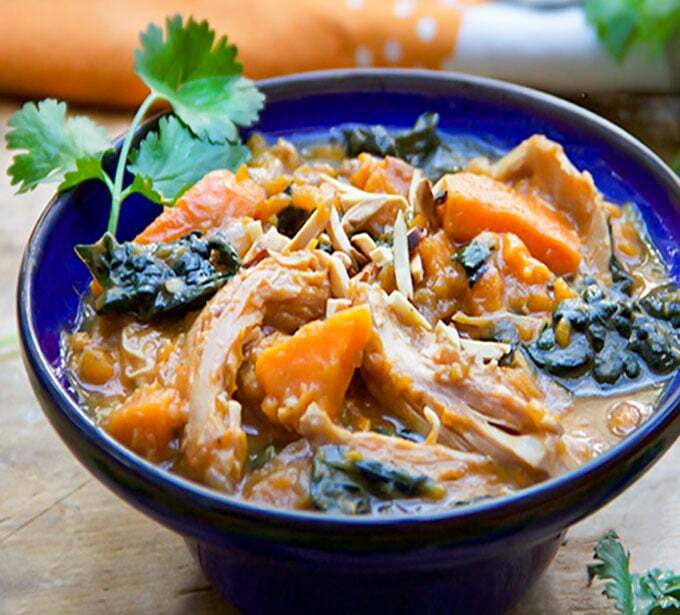 Here’s the recipe for Moroccan Chicken Stew with Sweet Potatoes, Apricots and Kale. If you try this recipe, please come back to leave a comment and a rating. I’d love to know how you like it! Author: Panning The Globe, Adapted from Barbara's recipe from some newspaper many years ago. 1 bunch lacinato kale (also called dinosaur kale or cavolo nero), washed, thick center ribs removed, leaves stacked and sliced into 1-inch strips. Slivered almonds, toasted in a skillet over medium heat, while tossing and watching carefully to prevent burning. Preheat oven to 350F. Sprinkle chicken generously with salt and pepper on both sides. Heat 2 tablespoons oil over medium-high heat in a large heavy pot or Dutch oven. Brown the chicken thighs in batches (5 or 6 at a time, so as not to crowd), about 4 minutes per side. Transfer chicken to a plate and set aside. Add aromatic vegetables: onions, garlic, and ginger. Lower the heat to medium and cook, stirring occasionally, until onions are softened, about 7 minutes. Add spices: cinnamon, cumin, coriander, paprika, red pepper, and salt. Cook, stirring, for 30 seconds. Return chicken to the pot. Add sweet potatoes, apricots, chicken broth and lemon juice. Bring liquid to a boil. Cover pot and transfer to the oven. Cook for 45 minutes. Remove pot from the oven and uncover. Using a large spoon or spatula, gently push aside some chicken and potatoes so you have a small area near the edge of the pot that’s mostly broth. Push the slivered kale down into the broth with a wooden spoon, a little at a time. It will shrink when it hits the hot broth. Gently stir the softened kale into the stew. Season stew with salt and pepper, to taste. Serve stew in bowls with cilantro and almonds sprinkled on top or on the side. Serve over rice or couscous, if you like. Really, really delicious! My only change would be to cut down on cooking time. I thought the sweet potatoes got too soft. I’m enjoying your websit with very interesting, flavorful recipes! This is amazing! I have been doing a different country dinner party every other weekend. Next one I may have to do this. My dinner parties include main meals, desserts and cookies. Will have to research what else I am going to serve for the other courses! Thank you for this blog! I will be doing a lot more researching from your blog! Hi Laurie, So fun that you host a theme dinner party every other weekend! I love that idea!! I’m glad you found my blog and I hope you discover some delicious recipes for your dinners. I made this yesterday for my Super Bowl gathering–it was a huge hit! Everyone wanted the recipe. Delicious, hearty, and easy to prepare. Thanks Nina! I’m so glad you enjoyed it – it’s one of my longtime favorites! I just finished this incredibly flavorful stew. It had just the right amount of heat and sweet! I will definitely make this dish again…and again! The only change I made was a reduction in the amount of cinnamon. My husband and I LOVED it!! I love dishes like this where all the flavors come together and there’s lots of sauce to mop up. I wouldn’t want to miss a single bit of this. You have THE most amazing recipes. I am not surprised to hear about the long term popularity of this one. I love the story. I love that it’s time tested. I love the honoring of your mother-in-law. Thank you for sharing. Great recipe adapted from our mother in laws all time favorites. Been making this dish without kale for years. Be sure to have some nice crusty bread to sop up the flavorful juices. Oh, what a lovely story associated with this recipe – Lisa – yes, I think we sometimes forget what it was like before the days of internet etc! I am always sorry that my mother’s recipe files got lost.